Vegetarian Shepherd’s Pie! ♡ Ay yay yaaaay. This is good. Shepherd’s Pieeeee on the loose! And veg only here! And these are vegetables that taste good. Like, REALLY good. Like, sauced up with a red wine gravy and baked under a layer of creamy mashed potatoes good. Want. Want. Want. I decided to put Greek yogurt in my potatoes to lean towards healthy while still being creamy-tangy, if you know what I mean, but if you want this to be completely vegan, that is no problem at all. Just use olive oil instead of butter and maybe a splash of non-dairy milk in your potatoes and you will be golden. And if you’re gluten free? I have a hack for you. Check ze recipe notes. Meat or no meat, dairy or no dairy, gluten or no gluten… we can work with everyone here. Can you smell it though? That red wine, garlic, olive oil, rosemary aromatherapy? I first made Shepherd’s Pie after Thanksgiving this year, because guess what we had a lot of in our fridge? Leftover mashed potatoes. This was and is an amazing way to use up some of those holiday potato leftovers. The mashed potatoes usually need a little help since they dry out a bit in the fridge, so just heat them up with a little water or milk and get them nice and creamy again, and then spread that magic on top of your silky, veg-packed mushroomy gravy. When you pull this out of the oven and the sauce is bubbling up around the sides under the barely-browned potatoes? That will not be a sad moment for you. This is a total comfort food meets real food situation. It requires pajamas or sweats. A big fluffy sweater would be okay, too. Blanket, slippers, and candle optional – big appetite necessary. Vegetarian Shepherd’s Pie ♡ saucy mushrooms, carrots, and peas topped with creamy mashed potatoes. Real food meets comfort food! Make the veggies: In a large oven-safe pot, heat the oil over medium heat. Add shallots and sauté until fragrant. Add mushrooms, carrots, and whole herbs (you will pull the herbs out later). Sauté until carrots are softened. Make the gravy: Add tomato paste and flour to the pot and stir. Pour in the red wine (sizzzzle) and scrape all the browned bits off the bottom of the pan. Let the wine cook out for a minute or two. Slowly add the broth, stirring it in until a gravy starts to form. Season with salt. Simmer over low heat to get it thickened even further. Bake: Remove the herbs. Stir in the peas, spread the mashed potatoes on top (brush with butter to be extra awesome), and bake for 15 minutes at 350. I finished mine on the broil setting for a few minutes to get it nice and brown on top. Gluten Free Variation: Skip the flour and stir in about 3/4 cup mashed potatoes to the veggies and liquid to make a “gravy.” Easy. Tasty. Vegan Version: Use olive oil in place of butter and non-dairy milk in place of the yogurt. Meat Version: Add browned ground meat to the gravy mixture. Yummy! Pro Texture Tip: I chopped up half of my mushrooms so there would be a better texture variety in the filling. If you don’t want to use red wine, just sub a little more liquid. No problem. i made vegetarian sherperd’s pie before and it didnt turn out great…so im definitely adding this to my list. Such a classic recipe, now everyone can enjoy it! omg this looks so good…. I’d rather have the veggie version all day than a meat version, this looks delicious! I love the yogurt in w/the potatoes. I’m MAKIN this! 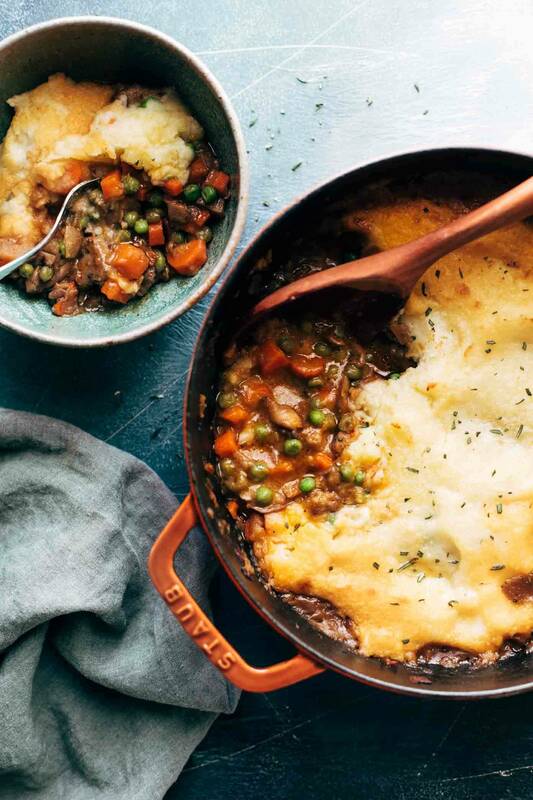 You had me at Shepherd’s pie!!!!! Being a vegetarian I can say that you just made my day! Can’t wait to try this,!! It is getting cold out there and this will help with that. Thank you for all of your inspiring recipes and all your insights! As a Brit, and these are traditional Briish foods, I can confirm a Shepherds Pie is made with Lamb, if its made with Beef its Cottage Pie. If it’s made with vegetables I’d call it a Vegetarian Pie. 🙄 Were you always this annoying, Claudia, or just since you “went vegan”? The only one annoying here is you elsie. They call vegetarian shepherd’s pies “Shepherdess Pies” in England. I think Cauliflower would be great! Would this work as a freezer meal?? Not a vegetable, but I’ve made a similar vegetarian shepherd’s pie with lentils instead of mushrooms (we’re not mushroom fans). It’s super delicious & the texture is amazing! How much lentils did you sub in? Same amount as mushrooms? I used 1.5 cups of lentils. I sautéed onions then added lentils and 2 cups of veg broth and boiled until the lentils were done – about 30-35 minutes. I love the tips on the bottom of the recipes. It’s great how you have alternatives for gluten free, vegetarian, adding meat and such. So helpful and great for everyone! YUM, YUM, YUM…you guys are always right on the mark when it comes to food! This sounds really good. I would definitely add meat because I can’t survive on that little protein. In case I haven’t said so before, I really appreciate that you include nutrition info. I was thinking about throwing in a handful of red lentils for the same reason. I dont get why meat eatwrs alwaya say “I can’t survive on that little Protine” you should actually read up on how much Protine can be found in veggies and beans. This is a vegan page its just so odd. Like okay add meat. Lol. I love this idea! Gotta try this for Meatless Monday! Shepherds Pie is British actually, not Irish. 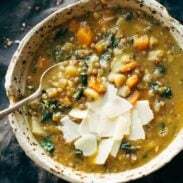 I made this last week after you posted it on Instagram Stories – really good and perfect for cold winter nights! Comfort food meets healthy real food is one of my fav combos! We actually never have tried a Vegan shepheards pie before, but this does look so good to miss out. Gonna give it a try soon. Thanks for sharing!!! I am def trying this out soon. Wow, awesome recipe! I`m gonna try this out today 🙂 Can it be cooked without the wine though? Lentills instead of meat. O so jummy! Genius…sheer genius! I just made this – so quick, so easy and SO delicious!! I did cook some puy lentils separately and invited them to the party. As someone else mentioned, the peas alone are not enough protein for this vegetarian. I found that 1 cup of broth was plenty to make a nice, rich gravy. Thank you so very much for an outstanding recipe!! I’m trying to rate this recipe, but for some reason, it’s not letting me. So…5 STARS!! Yum! I saw this on your stories. Looks so good! It’s meat free meals like this that keep people healthy and inspired to consume less meat and rely on the good foods of the earth. This isn’t looks good, this looks awesome and really delicious. I am always looking for vegetarian options for my family. Both my 2 and 4 year old loved it. Thank you!!! This looks delicious! I love shepherd’s pie. Will have to try the gluten free variation sometime!